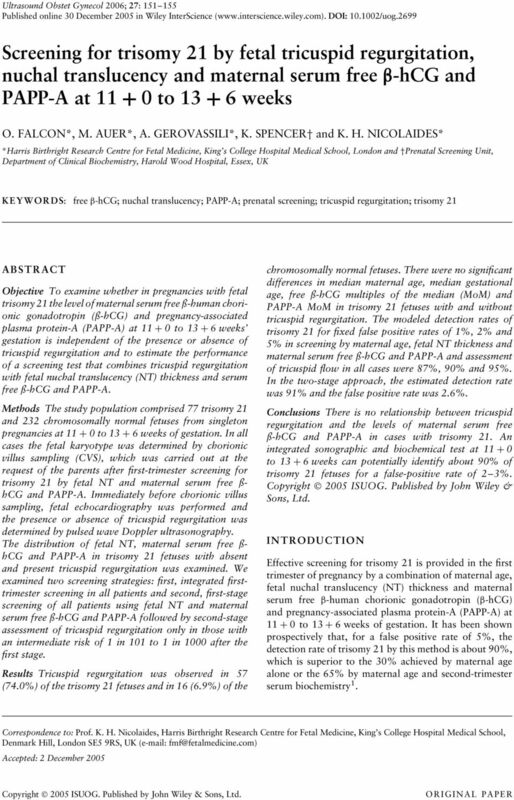 Download "Screening for trisomy 21 by fetal tricuspid regurgitation, nuchal translucency and maternal serum free β-hcg and PAPP-A at 11 + 0to13+ 6 weeks"
3 First-trimester screening for trisomy likelihood ratios for the two pregnancy populations were then used together with the age-related risk of trisomy 21 at 12 weeks gestation to calculate the expected detection rate of affected pregnancies at various false positive rates in a population with the maternal age distribution of pregnancies in England and Wales 6,14. 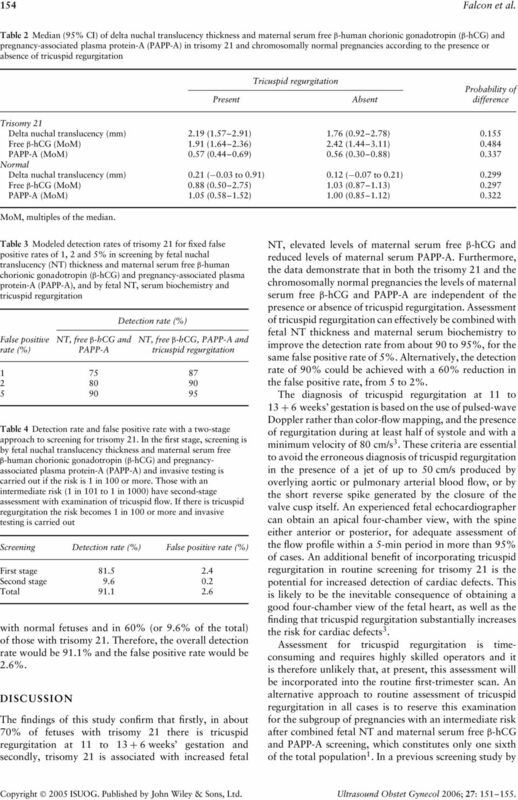 In order to model the performance of the two-stage approach to screening 1 using initially NT and maternal serum biochemistry followed by tricuspid regurgitation in those with an intermediate risk, we followed the procedure outlined by Wright et al. 17. 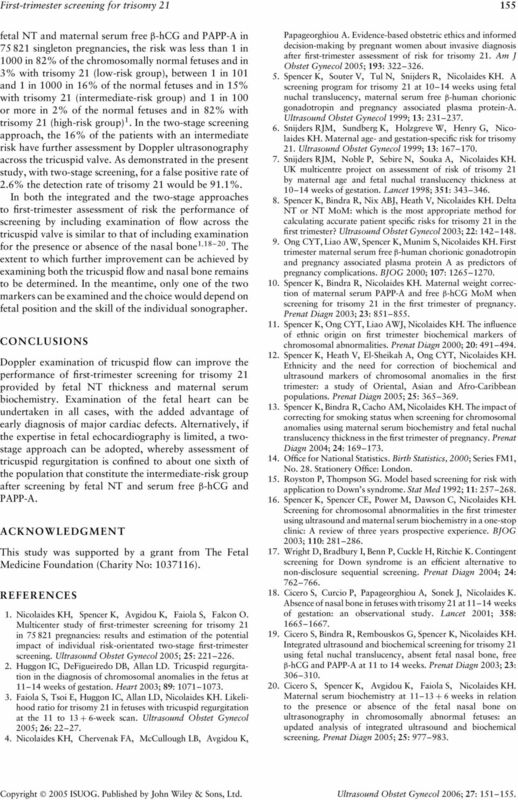 RESULTS The demographic characteristics of the trisomy 21 and normal groups are summarized in Table 1. The median delta NT, and free β-hcg and PAPP-A MoM, adjusted for maternal weight, ethnic group and cigarette smoking in the trisomy 21 and normal fetuses, according to the presence or absence of tricuspid regurgitation, are shown in Table 2 and illustrated in Figure 1. Comparison of the log 10 MoMs by t-test of unequal variance demonstrated no significant difference between those with and those without tricuspid regurgitation. 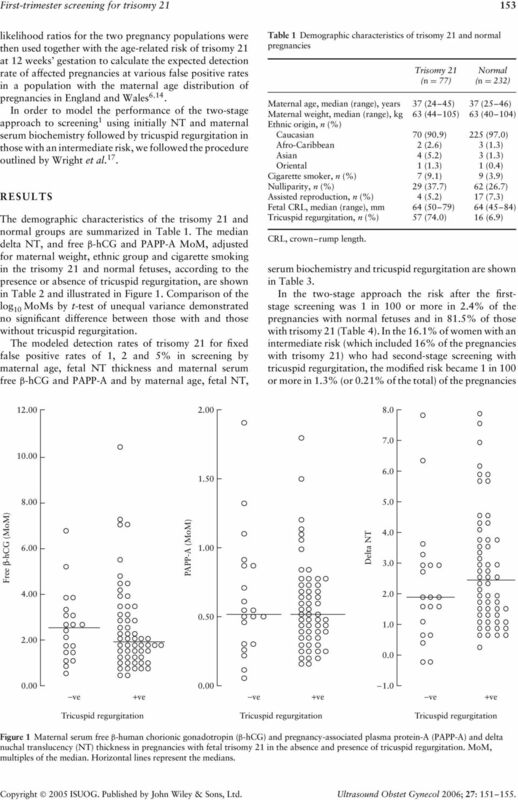 The modeled detection rates of trisomy 21 for fixed false positive rates of 1, 2 and 5% in screening by maternal age, fetal NT thickness and maternal serum free β-hcg and PAPP-A and by maternal age, fetal NT, Table 1 Demographic characteristics of trisomy 21 and normal pregnancies Trisomy 21 (n = 77) Normal (n = 232) Maternal age, median (range), years 37 (24 45) 37 (25 46) Maternal weight, median (range), kg 63 (44 105) 63 (40 104) Ethnic origin, n (%) Caucasian 70 (90.9) 225 (97.0) Afro-Caribbean 2 (2.6) 3 (1.3) Asian 4 (5.2) 3 (1.3) Oriental 1 (1.3) 1 (0.4) Cigarette smoker, n (%) 7 (9.1) 9 (3.9) Nulliparity, n (%) 29 (37.7) 62 (26.7) Assisted reproduction, n (%) 4 (5.2) 17 (7.3) Fetal CRL, median (range), mm 64 (50 79) 64 (45 84) Tricuspid regurgitation, n (%) 57 (74.0) 16 (6.9) CRL, crown rump length. serum biochemistry and tricuspid regurgitation are shown in Table 3. In the two-stage approach the risk after the firststage screening was 1 in 100 or more in 2.4% of the pregnancies with normal fetuses and in 81.5% of those with trisomy 21 (Table 4). In the 16.1% of women with an intermediate risk (which included 16% of the pregnancies with trisomy 21) who had second-stage screening with tricuspid regurgitation, the modified risk became 1 in 100 or more in 1.3% (or 0.21% of the total) of the pregnancies Free β-hcg (MoM) 6.00 PAPP-A (MoM) 1.00 Delta NT ve +ve ve +ve ve +ve Tricuspid regurgitation Tricuspid regurgitation Tricuspid regurgitation Figure 1 Maternal serum free β-human chorionic gonadotropin (β-hcg) and pregnancy-associated plasma protein-a (PAPP-A) and delta nuchal translucency (NT) thickness in pregnancies with fetal trisomy 21 in the absence and presence of tricuspid regurgitation. MoM, multiples of the median. Horizontal lines represent the medians. PRENATAL DIAGNOSIS Prenat Diagn 2002; 22: 308 315. Published online in Wiley InterScience (www.interscience.wiley.com). DOI: 10.1002/ pd.308 Increased fetal nuchal translucency at 11 14 weeks Kypros H.